These reviews are exciting to receive because they are a recognition of not only great writing but important historical facts. 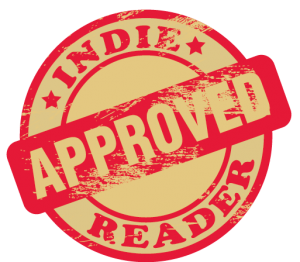 Associations, publishing professionals, magazines and others who have an audience outreach and who have reviewed “Shot Down”. Howard Snyder’s son Steve has, with the publication of Shot Down, provided historians and the public with a true and gripping saga of violent aerial combat, capture, evasion, imprisonment, and liberation. Shot Down also and notably records instances of compassion on the part of German soldiers, and from personal interviews with other Luftwaffe pilots, this reviewer knows that, like many Allied aviators, some of the German aircrews had joined up simply to fly in high-performance aeroplanes, a dream that was difficult to realize outside of military service in prewar Germany. The book is well researched by Howard Snyder’s son Steve, with many excerpts from letters his father wrote as well as other first hand and personal accounts interwoven. It is definitely worth the read. Where does one begin to start the review of this extremely well written, interesting and absorbing book? I have read and re­-read World War II aviation books by Saburo Sakai (“Samurai”) and Hans-Ulrich Rüdel (“Stuka Pilot”) and they were pretty much “the bible” for the best works by a pilot regarding the air war in World War II. Well, just as the “Old Testament” was the only bible for centuries “Shot Down” is the “New Testament” and completely supplants all the other works on the subject. What I found to be one of the best parts of the book was the final chapters where the surviving crew’s liberation is discussed and then the reunions of later years. I found it especially compelling because I have been to a few of the sites mentioned in the book and it is very interesting to learn the backstory behind the memorials. A memorial without context is just stone but the context of the joy and agony behind the memorials brings them to life. I especially appreciated that the author wrote his book in a revealing way without being vulgar, coarse or full of gore. I like to hear about what happened “over there” but I can become quite squeamish with an author’s mishandling of the topic. I found Steve Snyder handled all the afore mentioned items with much delicacy. I have read enough books about World War II that I figured I had burned myself out on the subject. For a conflict that ended 70 years ago, you would think that every important aspect has been covered. However, writers continue to produce enough new story angles that I have been pulled back in. There is no particular shortage of books about World War II veterans written by their children. There is, however, a clear shortage of good ones. So it has been a great pleasure to read Steve Snyder’s Shot Down: The True Story of Pilot Howard Snyder and the Crew of the B-17 Susan Ruth. It is without a doubt one of the good ones. The story of the actual attack and crash is, frankly, harrowing. Even seasoned readers of military history will be moved by the story of the explosion in the plane and each crew member’s effort to get out of the plane. Obviously since Snyder made it home to tell the story, we know he survived, but if you want to know what happened to the other crew members you’ll have to read the book. This is no ordinary memoir of a World War II father. The literature of the Second World War is filled with volumes written by sons and daughters, nieces and nephews who step into the shoes of the historian, hoping to preserve a small piece of their family’s history. Only a few are successful. With Shot Down and the story of the Flying Fortress Susan Ruth, Steve Snyder has reached a level of scholarship few amateur historians achieve. I finished reading Shot Down a little over a week ago, but wanted to savor this magnificent story before immediately running to my computer to write my critique. From the onset of this amazing story, I felt an instant connection with this author. He is proud. He is bursting with love. He is patient and he is on a mission to tell his father’s story not only with heart, but with precise accuracy. I was not aware of the tyranny and day-to-day trauma our brave men of this era faced. 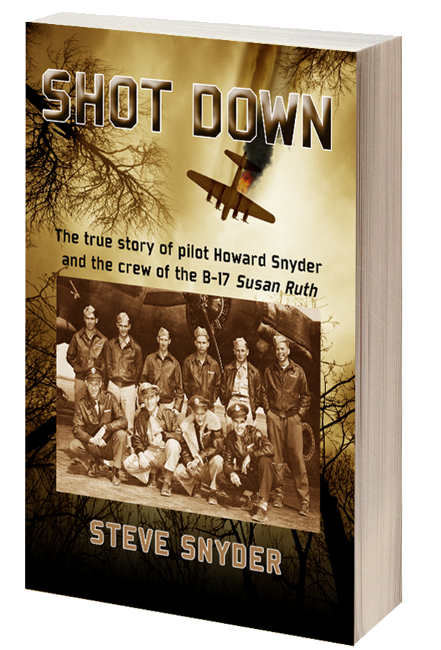 Steve Snyder’s masterful book, Shot Down, does justice to the adventures of his father, pilot Howard Snyder, and the crew of the B-17 plane Susan Ruth. Using first-hand accounts from diary entries, letters, and family stories, Snyder revives experiences that are accessible and relevant both to historians and readers with a casual interest in WWII history. This is a compelling true story of wartime survival, made especially interesting by the very different fates of the individual crew members. This is also a fitting tribute to the bravery of the 8th Air Force and of their helpers in the Belgian and French resistance. SHOT DOWN is an invaluable, richly-detailed, intimate yet thorough look at a dramatic period of world history, seen directly through the eyes of real people who were right in the middle of the action. 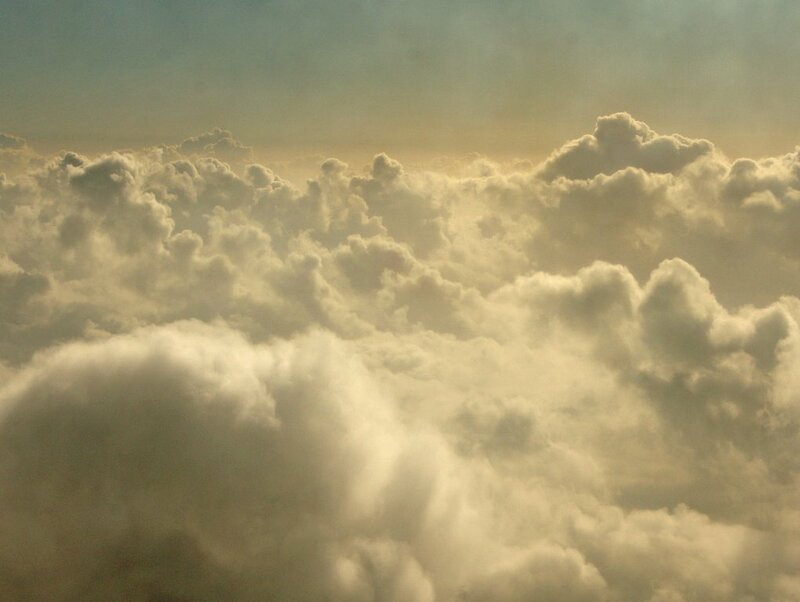 o broaden your knowledge of air missions over Europe during WWII! This book is a memoir of Steve Snyder’s father, Howard Snyder. Howard was the pilot in command of the B-17 Susan Ruthand along with the nine other members of his crew flew missions over Europe while attached to 306th Bomb Group. Thoroughly, exhaustively researched. Solid and well written. Some of the photos were difficult to look at, and some parts were sad to read, but that is the horror of war. I highly recommend this book for anyone interested in History. I found this book extremely interesting, informational, and memorable. Snyder does a wonderful job of capturing the reader’s attention throughout the book. I was able to learn more and more about WWII as I read, which is something I really enjoyed. It is easy to forget significant past events and the impact they had on people. Thanks to this book and the author, I was reminded, and all I feel is appreciation and respect for those who participated in the war. Throughout the book the author is careful to set the larger context of the war without losing readers to unnecessary acronyms or overly technical discussions. Shot Down is a son’s tribute to his dad’s wartime experience. But Steve Snyder is a very articulate writer and a thorough researcher. Shot Down is not confined to the B-17 Susan Ruth crashing or the Belgians hiding his father. The research into this segment of WWII is historically rich. Shot Down includes what made that era significant to everyone who lived it. It is Steve’s ability to weave our B-17 crews, the social attitudes and artistic happenings of those moments in his dad’s time, into a solid, factual documentary that makes Shot Down a remarkable, well-rounded snapshot of WW II. Shot Down should be required reading for all high school students. Steve Snyder began his search for details about his father’s World War II experiences after he retired. His findings, from diaries, letters, government records, and personal interviews, were extensive — enough for a book to be written. “Shot Down: The True Story” of pilot Howard Snyder and the crew of the B-17 Susan Ruth is a detailed account of that pilot’s wartime experiences as well as those of his crew and the Belgian patriots who saved and protected them. Snyder fills his book with priceless vignettes, putting a human face on the war, such as the time a drunken German Luftwaffe officer comes staggering up and tries to become pals with Howard who is in disguise as a border patrolman in an ill-fitting uniform while on his way to a safe house, or when a young German soldier shows kindness by putting Joe Musial’s partially severed foot on his own lap to keep it out of the dirt when transporting the injured flier to a house to get medical attention. He also goes into great detail over the ins and outs of a B-17 and its crew, even quoting the flight manual at times to bring new insight into his subject. Packed with enough information to satisfy the most demanding history buff and yet containing enough human interest elements to touch the hearts of those who prefer tales focusing on courage and self-sacrifice, Snyder’s well-written and fascinating account is a winner on both fronts. Written with immense detail, Steve Snyder has procured a fantastic piece of historical literature. No detail is left out as it follows the timeline both before the start of the war and after. The book is further brought to life by the plethora of pictures, documents, letters, and illustrations. The stories of ordinary citizens going to extraordinary measures, risking their lives to save others, are a beautiful testament to human nature. This book is a must read for anyone who loves books on history or WWII. For the first time, the full and complete story of the B-17 Flying Fortress Susan Ruth is shared in unbelievable detail. Shot Down was created from the vast number of letters and journals of Howard Snyder; diaries of men and women on the ground who rescued, sheltered and hid the crew; and interviews conducted by historians. Centered around the 306th Bomb Group in Thurleigh, England, it is informative, insightful and captivating. A masterful work. Enjoyable for those interested in the Eighth Air Force and/or the B-17 Flying Fortress, but it is also broad enough to appeal to general history readers. Insightful, engrossing, and succeeds on every level. Bravo. Normally I never begin a book review like this—but allow me to just come right out and say it: this book is excellent. Steve Snyder’s Shot Down: The True Story of Pilot Howard Snyder and the Crew of the B-17 Susan Ruth is extraordinary. When the book arrived in the mail, I was expecting another narrowly focused monograph written by an adoring son about the experience of his father in World War II. What I got was so much more. The book is painstakingly researched by Snyder who used historical documents, primary source letters and diaries, and first hand accounts from surviving WWII combatants. The volume includes over 200 photographs and graphics which detail the lives of both his father’s unit and crew and highlight the experiences common to all of the men involved in the air war in Europe. His dedication to ensuring that all of the details are correct are what make it all come alive. Our readers come from a variety or resources, most heavily, from Amazon, after they have purchased and read the book. (Five star reviews are common!) Other reviews come directly to our inbox from readers or email. If you’ve read “Shot Down”, we’d love to have you leave your comment below in addition to our other reviews! Oh my! Thank you so very, very much for contacting me, Linda. I am absolutely thrilled anytime I am able to connect to a relative of the crew. George is the only I knew of from the Pindroch (Pindroh) family. I’m sorry that there is not a LARGE print edition. I did print the book in larger than normal print, but probably not large enough for your needs. You need to get the book as it has over 200 time period photographs of the people involved and the places where the events took place. If you would like a signed copy of my book, go to home page of my website and scroll down to the bottom of the home page. Click on the BUY NOW button and you can pay by credit card through PayPal. I’ll then sign the book and mail it to you. I was an honor and privilege for me to write about these brave, young men who fought and died for freedom.